Vodafone Idea announced that the company is planning to invest about Rs.20,000 crore in networks over the next 15 months. It has given capital expenditure (capex) of Rs.270 billion for financial years 2019 and 2020, combined together. Out of that, about Rs.70 billion has been spent in the first nine months. In the next 15 months, it expects a capex deployment of Rs.200 billion. The capex guidance of Rs.27,000 crore did not include capacity that would be created by reusing equipment from the synergy of operations between Vodafone and Idea. Union Commerce Minister Suresh Prabhu launched the Hirkani Maharashtrachi scheme to provide a platform for women’s Self Help Groups (SHGs) and the District Business Plan Competition to boost entrepreneurship in Maharashtra. The Maharashtra State Innovation Society (MSInS), which comes under the State departments of Skill Development and Entrepreneurship, will execute the project with support from officials in the districts. Under the Hirkani Maharashtrachi scheme, women’s SHGs will pitch their business plan at the taluka level. Ten groups will be selected from each taluka and Rs.50,000 will be given to each SHG to implement their idea. Five SHGs at the district level will be selected and Rs.2 lakh will be given to each SHG to take their ideas forward. 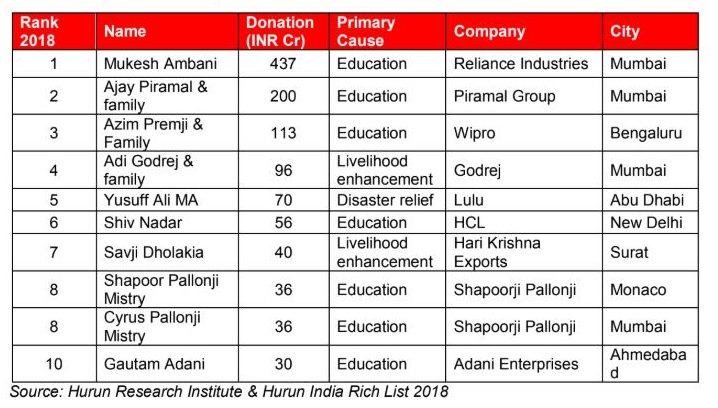 Reliance Industries chairman Mukesh Ambani and also richest person in Asia topped the Hurun India Philanthropy list with a donation amount of 437 crores. Shri Sanjay Kumar Verma(IFS: 1998), presently Ambassador of India to Japan, concurrently accredited as the next Ambassador of India to the Republic of Marshall Islands, with residence in Tokyo. India celebrated the National Deworming day on 10th February. The National Deworming Day (NDD) is an initiative of the Ministry of Health and Family Welfare, Government of India. The objective of National Deworming Day is to deworm all preschool and school-age children between the ages of 1-19 years through the platform of schools and Anganwadi Centers in order to improve their overall health, nutritional status, access to education and quality of life. According to the World Health Organization (WHO), 241 million children between the ages of 1 and 14 years are at risk of parasitic intestinal worms in India, also known as Soil-Transmitted Helminths (STH). The President said that justice is not an absolute and justice is not a constant. The very definition of justice, as well as the roads by which justice is reached, have evolved and grown through the course of human history. Over three decades ago, Justice Bhagwati and his generation of jurists spread the horizons of justice. Today, at our stage of development, there are new challenges in the realization of social and economic justice, and of climate and technology justice. The aim is to celebrate, raise awareness and promote the consumption of pulses at events around the globe. “Large focus on product development and on innovative applications of our pea fractions are of key importance at AM Nutrition. We continuously work on innovative solutions for our customers, and we feel highly motivated to further explore the great potential of our pea concentrates in all market segments”, remarks Laura Gil Martens, R&D Manager at AM Nutrition.